“Oh,” Janet said, “I knew it was right around now. Right around now? Good heavens, she’s right. It’ll be June in a day or two. Hardly more than six weeks until the Romance Writers of America 2013 Conference in Atlanta. Really? Already? Yes, already. But I’m actually in pretty good shape, all things considered. My Golden Heart finalist pin and my invitation to the RITA and Golden Heart Finalists reception arrived a few days ago. Both are sitting on my work table in the box they arrived in, waiting to go to the conference with me. I’m registered for the conference, the Golden Network Retreat, and a hotel room, and Cheryl, Colleen and I have our airline reservations. I’m getting to know my fellow finalists, and keeping in touch with my Starcatcher (2011) and Firebird (2012) sisters. I have pitch appointments at the Conference, and I’ve started to look at the workshop schedule. Over the Memorial Day weekend, I decided to find something new to wear to the Awards Ceremony. I’m not a Fashionista, and I can’t imagine myself in an evening gown, although I know many of my friends (most of them younger than I) will look gorgeous in theirs. I think the last time I wore a floor length dress was to a formal party in New Iberia, Louisiana, sometime in the early 1970s, and I have no idea what eventually happened to that dress. At the last two Awards parties, I’ve worn a gold-trimmed black tunic and black pants, and I was prepared to wear the outfit again. There will be two thousand people there, and none of them will remember what I wore last year. But, I thought, I’ll give it a shot. So on Saturday I hauled myself over to the Mall and checked out the two higher-end department stores, where I saw a couple of pieces I liked, but nothing that stopped me in my tracks. That was enough shopping for one day, and I had the black-and-gold to fall back on. But on Monday I decided to give it one more try. I looked at two more stores–nothing even close. But the second store brought me back to the Mall (twice in one weekend! ), so I went back to Dillard’s to look again. When I’d been there on Saturday, all the sales women were twenty three years old and size 2. On Monday I found a woman of comfortably middle years and figure on duty, which somehow made me feel much more comfortable about buying something. I came away with a multicolored, scoop-necked tunic with black trim to match my pants, and colors that go with my gold and turquoise earrings. Just what I wanted. One more item off the check list. I need to get back to writing, now, and make some progress on the third book in the series. I need to think about my wardrobe for the conference. I need to . . . Oh, what the heck. It’ll all come together, and we’ll have a blast. RWA13, here we come. Considering it’s May 31, you’re very much on top of things. Have a great time at the “seminar” to beat all seminars. Thanks, Pat. I’m looking forward to it. Let’s see, I should study the schedule, maybe redo my business cards, finish editing my manuscript and export it back out of Scrivener . . . But I have a handle on it. I think. Thanks for the reminder that I need to get organized, Kay! 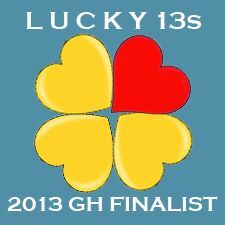 Can’t wait to meet you and the other Lucky 13s in Atlanta! Organized may be too strong a word, but we can hope. This will be my third conference, so I’m not as panicked as I was in 2011. Looking forward to seeing you there, Bonnie.